Bookbinders, such as Edwards of Halifax, got even cleverer with variations of the technique, producing books with “double fore-edge paintings”, where one image would be revealed when the book was fanned one way, and a second image revealed when fanned the other. 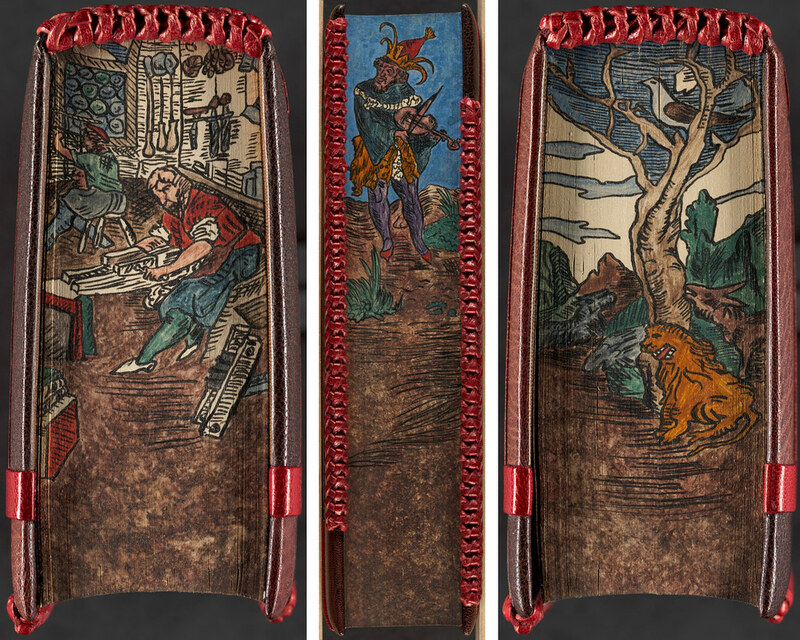 “Triple fore-edge paintings” are where a third image is added instead of gilt or marbling. “Panoramic fore-edge paintings” utilise the top and bottom and edges to make continuous panoramic scenes. “Split double paintings” have two different illustrations, one on either side of the book’s centre, meaning that when the book is laid open in the middle, each is seen on either side. Very rare and skilled variations of the art only reveal the image when the the pages of the book are pinched or tented in a certain way. Most often the artwork would reflect the content of the book (as shown in the chess example above). Sometimes it would depict the owner (through a portrait or picture of their home). And occasionally it would be oddly incongruous, such as The Poetical Works of John Milton being adorned with a painting of the tomb of Thomas Gray. One of the finest collections of fore-edge paintings is held at Boston Public Library, which you can see on their Flickr, and on a dedicated website, which includes an introductory essay by Anne C. Bromer of Bromer Booksellers, who along with her husband gifted this wonderful collection to the Boston Public Library. In this post we’ve featured our highlights from their collection. Hans Sachsens ausgewahlte werke. Man working in a shop (bottom edge) — Source. Man playing the violin (fore-edge, not fanned) — Source. Animals near a tree (bottom edge) — Source.